Many family entertainment centers find engaging smaller children a challenge. The large spaces and physically demanding games can leave little kids cold. We interviewed Mike Soon, owner of Diddalidoo, whose business focuses on serving this very segment. Diddalidoo is a unique indoor play area for babies and toddlers up to 4 years old, located in San Bruno, CA. BEAM: Can you tell a bit about Diddalidoo? Diddalidoo, Mike: Diddalidoo provides an environment where younger children, infants and toddlers, can play without being worried about older kids who are more mobile running around and over them. We have separate play areas, one specifically for crawlers. Then we have a play structure where older toddlers can explore and crawl around and experiment with different height areas. Parents can go in the play structure with them to guide them through. There are several play areas for younger kids where there are turntables, and of course we have the BEAM interactive games area. So kids can go from what they’re comfortable with to experimenting, and go back and forth. 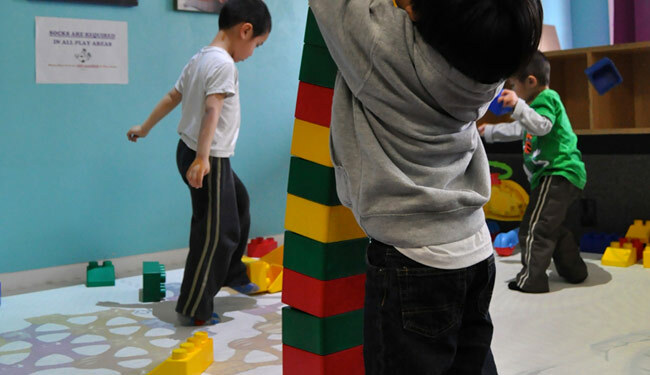 At the same time, there are other infants and toddlers around, and sometimes they engage with each other and sometimes they’re just playing around each other. It’s set up for lots of experimental exploration with other kids, and sometimes with parents and adults around. We’re not a huge space, and that’s on purpose-we want to not be intimidating for kids at this age. We don’t want to be like lots of family entertainment centers that are just huge warehouses. We’re more intimate. We have a café overlooking the play area, so kids can go back and forth and eat and snack. Parents are more than welcome to be in the play area, but at the same time they can let the kids explore on the own. So the kids can, when they’re looking for comfort, go to the area where they know their parents or guardians are, and then go back out and strike out on their own. BEAM: How long have you been open? Mike: Three years, going on four. Diddalidoo started six months after our first son was born. We just saw that there wasn’t a good place for parents to go with their infant children. When you go a Starbucks or another coffee shop, there’s just not enough space to explore, and they want to get out of the stroller and go do other things. A restaurant or café just isn’t an environment where little kids can roam around, especially with hot food and drinks moving around. BEAM: How long have you had BEAM? Mike: About a year now. Diddalidoo added it as more of a sensory development opportunity. We wanted to allow younger infants to crawl around and touch the projections, so we projected it onto a soft foam mat. The older kids enjoy the more mobile games like soccer and Cheese Heist, where they can run around and tap different things. It’s a good exploration experience for infants and toddlers. It’s also a hit during our private birthday parties, where we don’t have an age limit restriction, so a lot of the guests and the older children really enjoy it there. BEAM: What’s the feedback been like? Mike: Really positive. A lot of parents enjoy watching their kids on the BEAM interactive games; they’ll sit there taking pictures or interacting with the kids. Grandparents love seeing the joy and laughter with the little ones without have to chase them around. A lot of people have seen games at the mall or at other large environments, and now seeing them in a small environment that’s more geared towards younger children, they love it. They love seeing their kids entertained by it, and they keep coming back. BEAM: How has maintenance been? Mike: Very easy. It’s computerized. We are on a lease program, so we don’t have to worry about maintenance, and it keeps our games up to date as well. BEAM: What would you say to other business owners considering BEAM interactive games? Mike: It’s definitely something unique to add to your business. It’s a technology that’s new and exciting, but at the same time, not intrusive for young children. It allows them to experiment at their own pace while keeping them entertained. For parents and guardians, they enjoy interacting with the children. That’s the cool part, that it can accommodate different ages and skill set and physical levels.